Dawn Grey has been a dancer most of her life, with training mainly in ballet, tap, and jazz dance. And then she got older and life happened. She took a 14 year hiatus from dance to get a “normal” job with health insurance and to raise two kids. Then one day, found a flyer for belly dance classes being held at a new studio in the area. A desperate need for a creative outlet and an absolute love of dance pushed aside any trepidation and she signed up. She has been in love ever since. She has since moved to the Des Moines, IA area and as an ATS® certified instructor and a FCBD® Sister Studio is offering classes for both beginners and advanced dancers, in downtown Des Moines through the Des Moines Social Club. 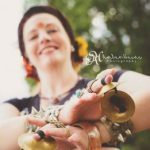 Dawn is also a member of the multi-state performance troupe Darshana Tribal, the director of Des Moines only ATS® performance troupe, Seize the Sway, and is available to teach ATS® workshops in your area. ATS® General Skills – April 2012, ATS® Teacher Training-May 2012.